The Karl King Band hosts an Open House. 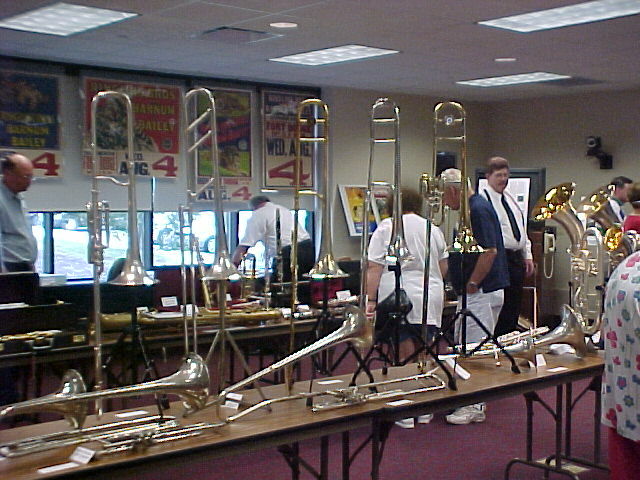 The public was invited to attend an open house hosted by the Karl L. King Municipal Band at the Fort Dodge Public Library on Saturday, July 6th, 2002. During the open house, special displays were showcased including historic items from Karl King's career and memorabilia of the various Fort Dodge bands, dating back to the 1880's. These exhibits featured photographs, letters, musical instruments, scrapbooks, concert programs, original circus posters, and more. Much of the materal was donated to the Band by the late Mrs. King, who had housed the collection in 46 boxes and 17 scrapbooks. Previously, the boxes and scrapbooks had been stored at the homes of various band members until the library rooms were designed. King Band Manager Duane Oley Olson commented, This collection of material is amazing for several reasons. First, it's overwhelming to think that Mrs. King kept it all. And second, despite having no home to store this collection until now, none of it has been damaged. Fortunately for the Band, and for Fort Dodge, it has been preserved and probably hasn't seen the light of day since Mr. King died in 1971. The open house was very well attended with a large crowd present at 10 AM when the open house began. Several current members of the band as well as Director Reggie Schive and his wife, Donna, were on hand to serve as guides and to answer questions. Duane Olson, announcer for the King Band, displayed many unique and historic instruments from his collection. Many of the instruments had ties to the Karl King Band. Nancy Olson, the archivist for the band, explained that there are many more items of interest not yet viewed by the public. Several important private collections relating to Karl King were on display. The only known audio recording of a conversation with Karl King could be heard at the open house.